Ford Motor Company has been granted a patent in the United States for an autonomous police car that can find a hiding place, flag traffic law violators, carry out pursuits, and administer citations all on its own, Business Insider reports. Ford applied for the patent in July, 2016, and it was just granted by the US Patent and Trademark Office earlier this month. Importantly, a human police officer would be placed in each autonomous police car throughout its deployment, there to take control of the vehicle as needed. But the vehicle would be capable of doing most everything on its own, according to the patent, using a sort of machine learning called “deep neural networks” to find a suitable place to hide out while it watches for traffic violations using inputs like cameras and LiDAR. Should a potential violation be detected, the car would connect to a central computing system to search a database of local traffic laws and determine whether a citation is warranted. 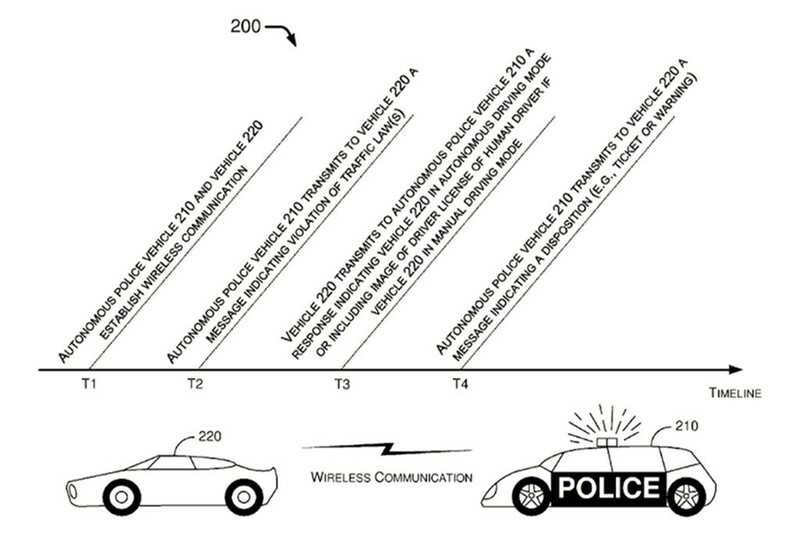 Alternatively, according to the patent, the car could receive information relating to traffic violations via a nearby communications tower, surveillance cameras, roadside sensors, or other motor vehicles using vehicle-to-vehicle communications. How getting pulled over by an autonomous police car might look. Should Ford’s autonomous police car at this point decide to pursue the offending vehicle, it could track the offending vehicle via surveillance cameras and its own onboard sensors, pull the vehicle over, and send and receive the necessary information with the traffic law violator using vehicle-to-vehicle communications. If that isn’t an option, the human officer is onboard to facilitate the transfer of information and issue the citation. If all of this sounds more than a bit frightening to you, you’re not alone, but you should rest easy knowing that this sort of technology is likely a very long way out – if it ever comes at all. Ford, rival automakers, and a range of tech companies are still several years out from completing production-ready autonomous vehicles for basic transportation, nevermind policing for traffic violations and carrying out pursuits beside. Ford’s patent describes a technology that’s certainly possible, but that we’re unlikely to see any time remotely soon. I have a better idea, wanna hear it? Okay great here it is……NO AUTONOMOUS VEHICLES EVER!!!!!!!!!!!!!! Cars are meant to have human drivers and that’s the engine. It’s bad enough we have electric vehicles and hybrids. We humans draw the line at having our cars drive for us. Didn’t anyone watch Terminator, Maximum Overdrive or any of the Matrix movies?